Hudson Bay sea ice coverage is only slightly below average for this time of year (week of 14 May, below) but well above levels for 2006, when Western Hudson Bay breakup was relatively early). Figure 1. 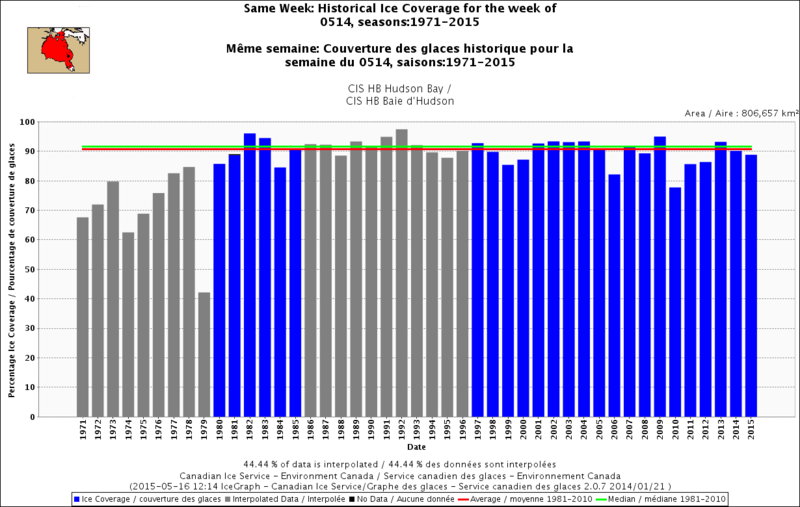 Sea ice coverage over Hudson Bay for the week of 14 May, 1971-2015. Canadian Ice Service. Click to enlarge. Even at its highest extent in April, Hudson Bay is only 97-98% ice covered (due to persistent shoreleads and polynyas), which means ice levels are currently only 10% or so below maximum. In other words, there is still lots of polar bear hunting habitat over the bay. That’s a bit lower than ice coverage was for the last two years at this date (2013-2014), which had average or above average ice cover. However, there is currently a bit more ice on Hudson Bay than there was in 2011 and 2012 – and much more than there was in 2010 and 2006.